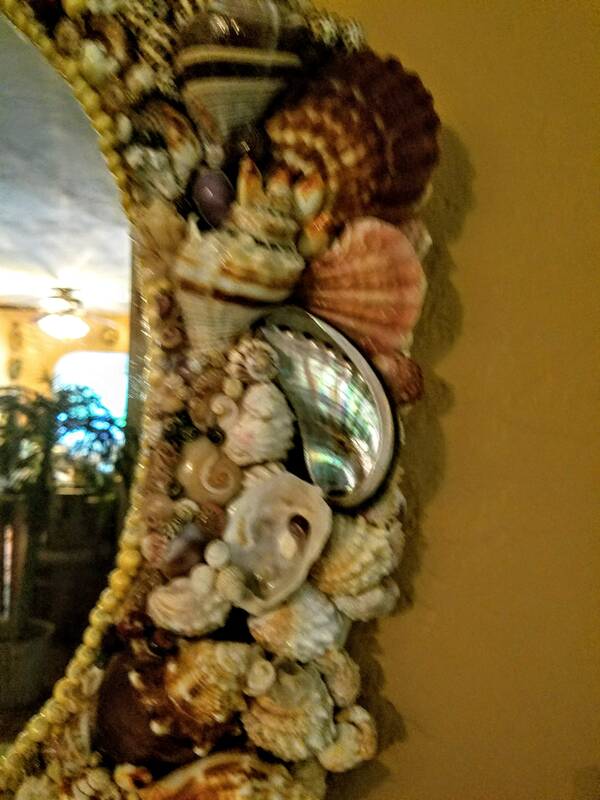 Presenting "Reflections II"; large, baroque estate series seashell mirror. Reflections II is an exquisite marriage of hand collected shells from my private island beach and boldly colorful species from around the world. 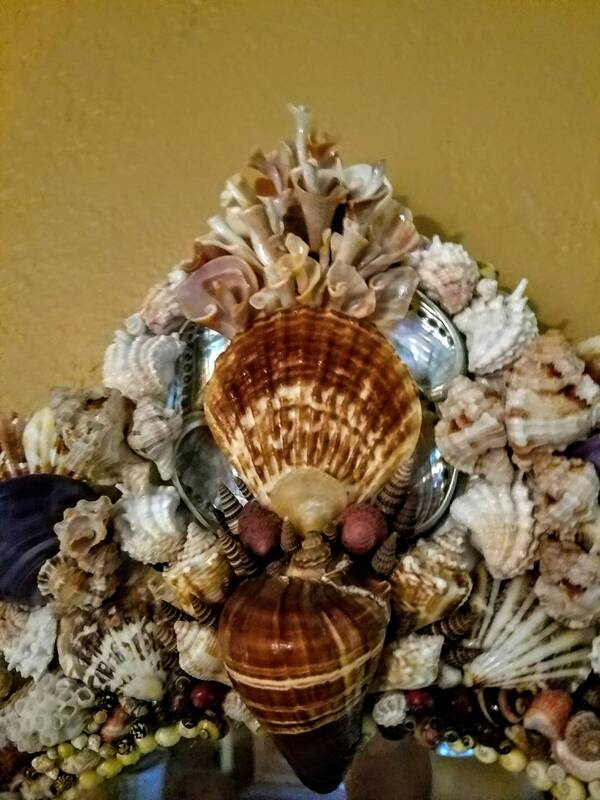 Reflections II features richly crimson Fighter Conch, Apple Murex, Spiny Jewel Box paired with Green Abalone, Strawberry Tops and two, Polished Purple intact Clam shells adorn the top, then crowned with my signature, tumbled Flower Buds. The inner rim against the oval glass is layered in graduated sizes of tiny Mongo shells. Reflections II took inspiration from my blue ribbon, 2018 Sanibel/Captiva 1st Place winner of the Professional Artistic Division Shell Show; "Reflections" that expanded my range by adding exotic, globally sourced species. This mirror will stun in a variety of designs venues from Midcentury Modern to British West Indies and more. It's color scheme rich in style; uncompromising elegant. PLEASE NOTE THIS EXACT MIRROR HAS SOLD AND SERVES AS A TEMPLATE FOR YOUR OWN CUSTOM ORDER. 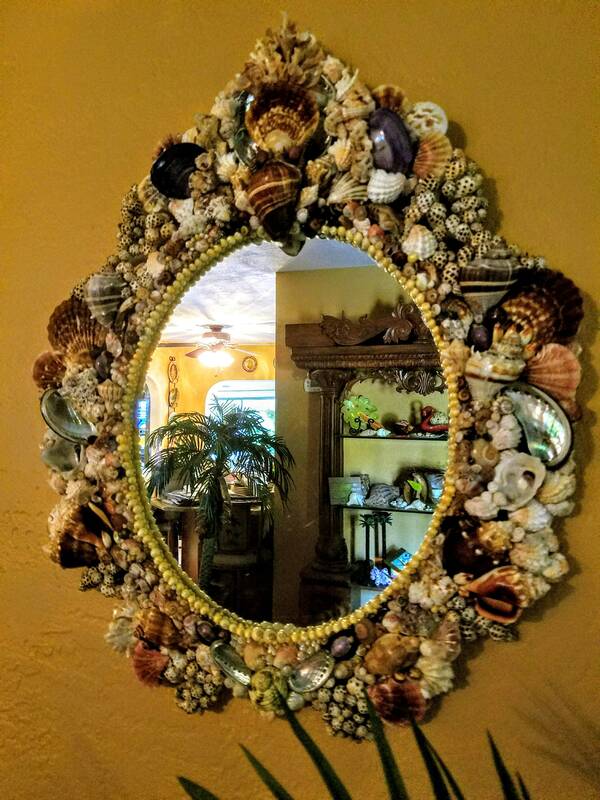 The listed price point includes 3 dimensional shell artistry, exotic, globally sourced shells combined with hand collected species and inner rim, layered detailing against the oval cut glass. 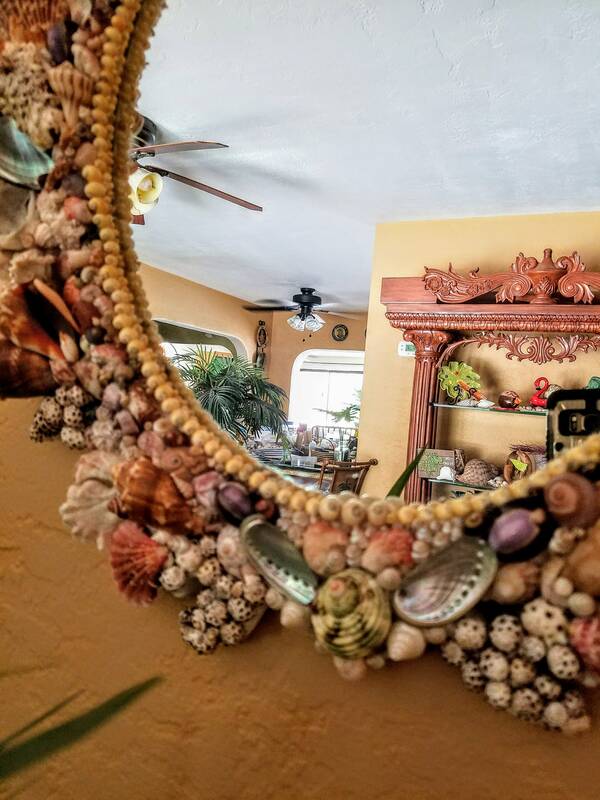 This mirror can be customized with less detailing and choice of shell species lowering the price point to a minimum of $1,000. The end result will have a similar, overall design. Keep in mind, no two mirrors are identical. It measures approximately 24" x 23 x 3". A complimentary design consultation is required ahead of your custom design and please allow 4 to 6 weeks to complete depending on level of detail. Each mirror is professionally fitted with a wrapped steel wire for ease of hanging, sealed with a clear acrylic coat to protect from fading and easy dusting (brush included).